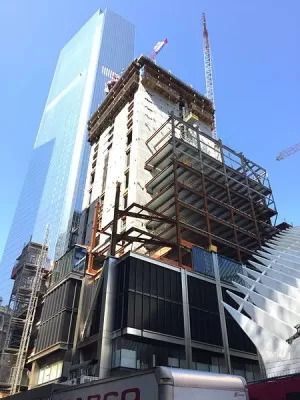 This new skyscraper is located at 175 Greenwich Street. The supertall high-rise is an 80-story office tower in the Financial Distinct, due to rise 1,079 feet. The concrete core has reached roughly the half-way point, reports YIMBY. 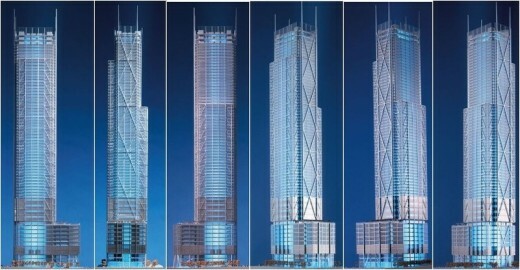 The core is now closing in on the neighboring Four World Trade Center, which stands 977 feet in height. Steelwork exists roughly halfway up the tower, and fireproofing and glass installation underway on the lower levels. August 12, 2015 – Silverstein Properties’ 3 World Trade Center is getting a little haircut. The tower, designed by Rogers Stirk Harbour + Partners, was slated to be 1,168 feet tall, according to New York YIMBY, but will now rise to a height of 1,079 feet, as rooftop spires will no longer be part of the plans. According to The Real Deal, the developer financed the construction of the 2.5 million-square-foot, 80-story building through $1.6 billion worth of tax-free Liberty Bonds. Tenants will include advertising firm GroupM, which is taking more than 500,000 square feet of space. The skyscraper design by UK architect Richard Rogers on the site of the World Trade Center may have to be abandoned after developers fail to attract any interest. 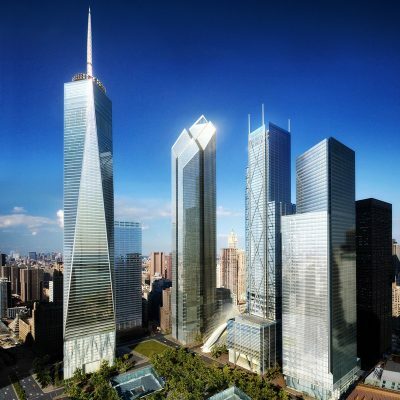 The tower, to be named 3 World Trade Center, was due to rise 80 stories above Ground Zero, and had been scheduled for completion in 2015 – 14 years after the terrorist attacks on New York. But in response to a lack of interest from prospective tenants, Larry Silverstein, the site’s developer, said plans may be scaled back and instead construct a building of only seven stories unless tenants were found this year. The new building would become a retail mall rather than the office space planned for the original skyscraper building. 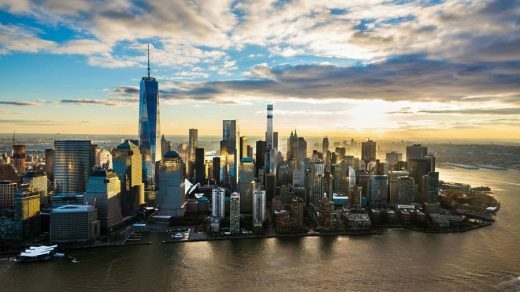 Controversial towers to replace the World Trade Centre skyscrapers lost to New York in 2001. The main skyscraper by Libeskind was to be a significant number of feet high – 1,776 feet – to mark a key American date in history – United States Year of Independence; the building was largely handed over to architect David Childs. Designed to be the tallest tower in the world for the site leaseholder – real estate developer Larry Silverstein. The angular design is typical for Libeskind but here echoes the Statue of Liberty. A Snohetta building was also due to appear but the situation is in a state of flux. 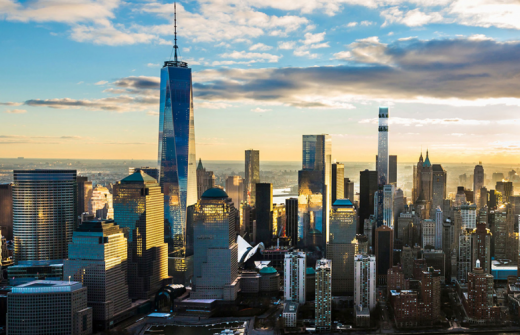 Daniel Libeskind was commissioned to design the Freedom Tower after a strongly contested World Trade Center design competition in Feb 2003, beating architects such as Norman Foster and in the end winning a two-strong shortlist. In 1946 New York State Legislature set up a WTC Corporation to analyse such a facility. The World Trade Centre idea formed in 1960* and preliminary drawings were drawn up by SOM, who slipped in behind Libeskind 43 years later (via David Childs). Michigan-based Minori Yamasaki and Emery Roth & Sons completed the Twin Towers between 1966 and 1973. Yamasaki had over a hundred schemes, one being a single 150-storey tower. Towers 1 & 2, nicknamed ‘David & Nelson’ after the supportive Rockefeller Brothers became quintessential New York symbols, appearing on a large proportion of postcards.